A spokesperson for Panasonic has said that the company is quite excited by its new lens. 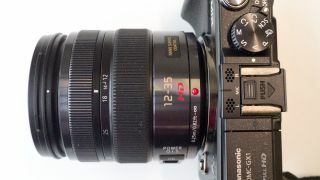 Speaking to TechRadar, Barney Sykes from Panasonic UK said, "I think it's quite a breakthrough lens, for someone to launch constant aperture at 12-35, it's a big thing, it's a big statement and we're quite excited." The 12-35mm X lens was announced as being in development several months ago, but was only officially announced with a price and full specs in May. Costing around £1,000, the lens is an expensive proposition, but the company is hoping to emulate the traditional 24-70mm zoom lens often sold as a standard lens for full-frame DSLRs. As Four Thirds sensors have a 2x crop factor, 12-35 converts to 24-70mm. Sykes continued, "It's important for us, if we want to become a true system camera brand, that we develop lenses like this." Although it's not yet available to buy, Sykes says that feedback to the lens has been good. "Initially, the feedback has been really really positive, there's a lot of demand for it." At the time the 12-35mm lens was announced as being in development, Panasonic also said it was working on a 35-100mm 'X' lens, however this is yet to make its official appearance. Sykes says that interest in the other lens has been heightened by the 12-35mm announcement, but there is no new information he can give.